(42) As a generalisation it would be fairly safe to say we tend to trust those who have expertise in a given field or topic to guide us. So when some individual scientist pops up in the media somewhere to tell us something, then we'll often tend to listen and take heed of any warning/s. It's what mankind has always done - for example the tribal witch doctor, ancient Greeks and oracles. The power to sway the beliefs of the masses can be especially stronger today when it comes via multimedia and even more so if the information comes from a notable scientist or scientific organisation(s), or else ostensibly connected in some way to scientific research. Yet you will often see TV media presenters bringing climate "experts" onto their show in an apparent effort to give some credibility or background information to a particular subject i.e. melting of the polar ice caps, glaciers retreating and so on. Have you ever wondered about these people when they are so definite about mankind causing climate change? Have you ever wondered how much of the information is from their own expertise and how much is what they've learned from someone else? Are they really passing on real proven scientific facts or just what they believe to be true from information provided by someone else? Or do you just accept what they are telling you? To date despite the claims to the contrary, the efforts of the best scientists in the world have yet to find a definitive pointer that identifies mankind as the actual cause of dangerous global warming. 3. Life Sciences - studies of living organisms e.g. biology, anatomy. The average person on the street might be forgiven for thinking that climate change scientists are primarily meteorologists or climatologists plus perhaps some others with supporting expertise. But that would be only partially right. The subjects relating to climate change actually diverge into more than 100 scientific sub-disciplines, the elements of which can be exceptionally intricate, highly complicated and intertwined. Just changing one of the many data inputs e.g. the output chemistry of sub-sea volcanoes to a climate change puzzle can flow-on to incorrect or at least misleading changes in the final solution. And the answer will still be a "best probable" result - not fact. No matter how acclaimed a meteorologist, climatologist, physicist, chemist or any other individual scientist may be, they will generally only have a partial knowledge or exposure if any, to other sciences that affect climate change. At most there may be a handful of scientists that have mastery of two or three scientific disciplines such as Professor Robert M. Carter (decd) who was a qualified palaeontogist, stratigrapher and marine geologist. Yet even if a scientist does have expertise in two or more of the climate change elements, he/she still needs to find and use data from other sources to cover the gaps in his/her own knowledge. Such data may in turn only be a "best probable" solution as opposed to fact(s) as will be explained further below. Alternatively a scientist may collaborate with others from different scientific fields but at some point they will likely need to use other scientific "best probable" results, or use a form of scientific calculation where the data to be input is not known for example Baynesian Reasoning theorem - read educated guesswork. It must therefore be obvious that there can be no such thing as an "expert" simply because no one can fully comprehend the entirely of it all. This doesn't stop the media, in particular the TV media in regularly presenting interviewees as experts to lend credibility to their show. But anyone who claims or admits to being an expert in climate change is either kidding themselves, egocentric or is being deceitful. The bottom line is that when a supposed expert fronts up in the media - watch it guardedly or else switch the channel. At the end of the day everyone, including the scientists themselves are basically amateurs when a topic is outside their own field of expertise - even if they are an educated amateur. But having someone with at least some scientific background involved in climate change discussions has got to be far more preferable than pulling celebrities into the debate. These people despite their best intentions, are simply promoting their own views and muddying the waters for the public to make a realistic conclusion in their own minds. So WHO Are The Climate Change Scientists? *are arguably the loudest in generating alarm about AGW and the warming of the planet. *generally see no real cause for alarm when comparing current climate with past climate. *are experts in enabling disciplines such as mathematics or statistics. Baynesian reasoning is widely used in science where some but not all the information is known. It's an important technique for statistics and especially in mathematics but it does not produce factual evidence. 3. each pulls out a red apple. The logical conclusion is that the bag must be full of red apples. This may be accompanied by an indication regarding confidence on the degree of probability e.g. 95% confidence that the bag is full of red apples. In other words, "If it looks like a duck, quacks like a duck and walks like a duck, then it must be a duck"! Obviously the methodology is much more complicated but the logic remains pretty much the same. The theorem is widely used and is perhaps an acceptable scientific method in some circumstances, but what matters most is how the resulting answer was and is still being treated as scientific fact. In the example of the apples, if one were to loudly and unreservedly claim that the bag is full of red apples then that would be at best simply wrong, or at worst underhanded. Yet this sort of thing is exactly what is happening on both sides of the AGW - Anthropogenic Global Warming debate. This Propaganda v. Science image shows an alarmist claim at left with a sceptic response at right. Neither side yet understands that if you lie about something you will eventually be found out and lose credibility to their cause. A classic example of misleading propaganda is the infamous Hockey Stick diagram produced in 1988 by pro-AGW scientists Mann, Bradley and Hughes. In that case they cobbled actual thermometer temperature records to the foot of estimations of temperatures calculated from proxy data over the past 1000 years and then extrapolated global warming out to the year 2000. Then it was promulgated with a 95% high probabilty in being correct. In this case one of the major flaws in statistical calculations was to add real temperature records to assessed or calculated historical records using proxy data. For a scientist to formulate a reasonable hypothesis about AGW he/she would need to have some level of familiarity in all three groups - something which is nigh impossible. It's therefore not surprising that there are differences between the various scientists and scientific fields using different "best probable" data so it should never be said that the science is "settled". It isn't. Not unequivocally - even though the IPCC offers what some might consider to be reasonable answers. Ultimately the theory of AGW is still based on circumstantial evidence including calculated probabilities. Apart from that all three groups of scientists generally DO agree that the Earth's climate has always changed, that human emissions affect local climates e.g. urban areas and have a summed potential to affect climate globally, and that carbon dioxide is a mild greenhouse house - note the word "mild". The real argument then is not about whether the Earth is heating up, but about how relevant is AGW when considered against natural climate change processes. Source: Climate: The Counter Consensus 2010, Professor Robert M. Carter. (1017) So how many years of study does it take learn all about everything? then I notice that Professor bob Carter, Born in 1942, not that means anything is telling us that the Mann reconstruction of past temperatures is the only one, It's 2017 not 1988, a lot of work has gone on since then. Is he aware of it, are you? And what does he mean by CO2 is a mild greenhouse gas? To me he seems to be playing a semantic game rather then seeking to unbiasedly inform his readers of the facts. Other gasses have a stronger effect certainly but they are complex molecules and break down and don't persist in the atmosphere like CO2 that is why when we talk about humans affecting climate we are mostly concerned with CO2 emissions. He should know all this, why does he not communicate it to his readers? So how many years of study does it take learn all about everything? then I notice that Professor bob Carter, Born in 1942, not that means anything is telling us that the Mann reconstruction of past temperatures is the only one, It's 2017 not 1988, a lot of work has gone on since then. Is he aware of it, are you? Thank you for taking the time to provide a comment, but please let me point out that it's not possible in this limited space to use the contents of an entire book. The Hockey Stick: I don't believe I said that the Hockey Stick produced by Mann et al was the only one. Nor did Mr Carter. I know there were several of them which I alluded to in a previous post on this site about this topic. Greenhouse Gases: Mr Carter isn't saying it's a mild gas. He was I believe repeating what is widely (but not by everybody) accepted across both sides of the debate about AGW. Obviously there are far left and right beliefs on both sides. And there is also strong evidence to suggest that CO2 does not last in the atmosphere for at least 100 years or more, but rather like 4-5 years at most. In addition further evidence has been presented that basically suggests the strength of CO2 as a warming agent diminishes as more CO2 is added. Perhaps you might pooh-pooh that idea. I will be putting up an article is due course directly about this together with the relevant source material. Bottom line is that Mr Carter used an entire book to explain his points of view. I don't accept them all. I don't necessarily accept any points of view from either side unless it is at least logical and appears to be well supported by scientific peers. (1017) There are also entire books about Bigfoot and the Lochness monster. This is not about Left vs Right its about Facts vs Fiction. I know what you are talking about that the effect of CO2 diminishes as more is added, that is not a new revelation, the question is are we anywhere near that point yet? I will tell you the answer is no. CO2 is removed from the atmosphere in 4-5 years? an individual molecule might go to the living biosphere or absorbed by the oceans (we can detect the PH of the oceans changing because of that) and then that molecule might return to the atmosphere (notice the little squiggles in the Keeling graph?). We don't understand perfectly what is going on but we know allot more then your book is telling you. We are concerned with the level of CO2 concentration in the atmosphere and we are certain that it is increasing since the industrial revolution due to the burning of fossil fuels. 1. I'm getting an impression you're seizing on comments that you think were unsupported in Prof. Carter's book? Have you read it? I do believe he explains each of his points quite clearly, often using graphic images and also supported by a comprehensive list of 354 reference sources. He devotes an entire chapter about climate sensitivity and CO2, written in a lay language that can be readily understood by the average educated person. Much of what he says makes sense to me - bearing in mind that I am not a scientist myself. Personally I wish that more scientists would publish a lay-science version of their findings to the public, so that their original scientific material cannot be cannibalised to read something entirely different to what the author was originally saying - on both sides of the debate. 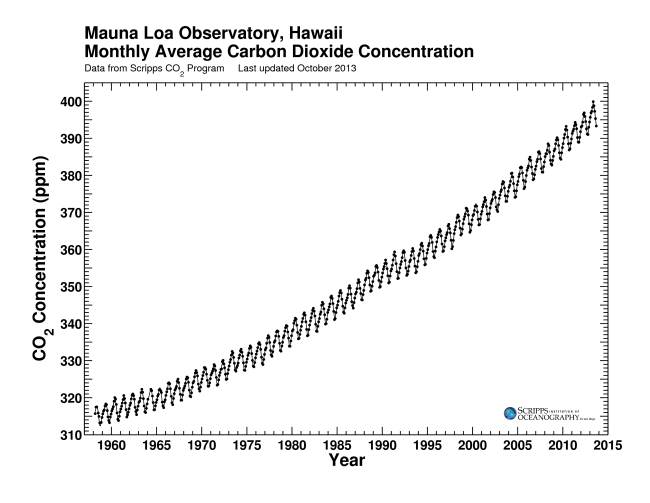 Your Mauna Loa graph shows nothing new and does not convince me of anything other than what is already known and admitted by arguably most scientists, even the sceptical ones that the levels of CO2 in ppm has risen now over 400 ppm. It's undeniable. Another thing to understand is the global warming has, and continues to be an upward, up and down trend. Sometimes it even cools despite continued CO2 emissions and that happens naturally as well according to historical proxy data. The real likelihood compared to a supposed one, is that at some given future date on a non-linear upward warming trend line, is that the temperature will be lesser than the linear result suggested by the IPCC. I don't believe you'll find much argument from most so-called deniers or sceptics that the Earth is warming up. I believe the question should be about how much mankind is contributing to that warming. And how much of a priority should research dollars be allocated to proving that, and how much towards finding ways to meet with future natural disasters. Personally I don't have a problem per se with reasonable emissions reductions in over-polluted areas. But the Kyoto and Paris protocols on emission reductions could be considered by some to be over-the top. Renewable energy would be okay provided it can be done efficiently. Yet that still isn't the case. Technology simply hasn't caught up. In South Australia recently there have been two major power blackouts because the renewable energy systems failed during storms. But it would be nice not to live in smog. Unfortunately the majority of the research effort seems to be going into proving mankind is responsible for the problem, instead of finding ways to deal with the damn thing - such as new technologies. To my mind the vast amounts of money being spent trying to finger mankind as the cause of the problem is just a waste of money. By all means reduce emissions. But stop chasing the rainbow of a potential false god of AGW. Put it towards systems that make more effective responses to natural climatic events because as sure as night follows day, they are going to happen - with or without mankind's efforts. I believe the Earth is now warming naturally following the last Little Ice Age. How high that warming would have been - or continue to be without mankind activities is plain conjecture. But mankind's contributions do not appear to be particularly high in the scale of the natural totality. Especially, and for just one example that the entirety of the forcing and feedback systems are not yet fully understood. The IPCC for example refuses to acknowledge water vapour as a feedback agent, something which if they did so might very likely negate their hypothesis of AGW. 2. Your comments on books being written about all kinds of controversial subjects such as the Loch Ness Monster is acknowledged. But the entire point of my writing is to try and get people to start reading counter views and giving it some serious thought without a knee jerk reaction. My perception is that is what you may have done, given your response that followed so quickly following publication of my post. I hope I'm wrong. But if it is the case, then I have to say I am not interested in discussing issues with those who display a strong bias as no progress, conclusion or some kind of agreement can necessarily ever be reached. (1017) Thanks for the response but you haven't really addressed the issues that I have raised, I don't think that its possible for you do that by pointing to something that has anything to do with physical reality. If I did read his book would I find out why Carbon Dioxide levels stayed pretty much stable since the end of the Ice age and then started increasing at a rate and too a level unseen in the paleontological record just at the same time as the industrial revolution? Your assertion that 99.55% of total greenhouse emissions has nothing to do with mankinds activities is false and I know that it is false. Are you insulting my intelligence expecting me to believe that? You can argue about funding priorities and the limitations of current technology all you want but if you can't get the basics right on simple stuff, why listen to you? Water vapour is the most abundant and important greenhouse gas in the atmosphere. However, human activities have only a small direct influence on the amount of atmospheric water vapour. I note the word "However .... "? So therefore the subject is not considered? Interesting if that's the case, because that is exactly the same stand that the apparent leader on AGW takes i.e. the IPCC. Why is water vapour and any of the other 100 or so other elements of climate change not being considered? One of my bigger issues with the IPCC, and by default NOAA and other scientific organisations that have come onboard with the AGW blame game, is that it (and they) only look at the entirely of the climate change issue from a narrow viewpoint - i.e. from mankind's activities. It's not logical to me to look at only one contributory aspect of a problem, then extrapolate that as an answer for the whole. This is the sort of thing that comes from having a theory and then proving it - as against accepted scientific practice of examining ALL issues to come up with a result, or at least a "best probable" result. I glanced over the rest of the article but I fear it's based on the false premise as mentioned above. Its scope is simply not wide enough to include all aspects of climate change outside of mankind contributions. I mean for example, what is the point of talking about radiative forcing's or feedbacks if you don't include ALL the known factors? It's pointless. Further too, the mandate of the NOAA is not specific to climate change per se. From what I can see they and other scientific organisations not mandated specifically to climate change are just repeating what they being told ultimately by the IPCC. And in any event their prime expertise appears to be centred just on the oceans with maybe Geoengineering and perhaps a couple of other sub-disciples of climate change being applicable to some degree. Therefore, any information they need for their own research outside the scope of their expertise must be gained from someone else - I'd venture from the IPCC itself. Let me try and be a little more clear. I'd also like to correct a statement I made in para 5. Greenhouse gases under the Kyota Protocol include CO2 (1), Methane (21), Nitrous Oxide (310) and others. Numbers in brackets indicates the warming potential compared to CO2. The main one listed here by the IPCC is CO2 but it is NOT the major one. Without going in details and for the purposes here, the other gases are in minute amounts compared to the totality of greenhouse gases currently present in the atmosphere. The biggest factor being water vapour was not included, for reasons as discussed in my previous post. I don't have up to date figures. If you have them please feel free to share them. But as of 2010 there was an estimated (according to the IPCC) up to 780 Gigatonnes (Gt) of greenhouse gases all combined. Regarding just the carbon content, the IPCC says that 7 Gt of carbon as CO2 is added to the atmosphere each year from all sources, and that half of it is because of human activities i.e. 3.5 Gt. The IPCC says that CO2 will be resident in the atmosphere for more than 100 years. Several other non-IPCC scientists calculate a "residence" time of 5 to 10 years. But even if we use 100 years it still only accounts for 0.45% per year (3.5 parts of 780) of the total greenhouse gases up there. These are based on the IPCC's own figures. This allegedly is similar to the 0.1C deg (not 1 deg as mentioned previously) of human contributions to global warming. I don't necessarily accept all of Segalstads assertions, but he does make many interesting counter points to that of the IPCC. (1017) Can we drop the pretense that the fact that water vapour affects climate is missed out by people that can be described as climatologists because they are stupid or that it's a secret, such a good secret its publicly available on Wikipedia. Svante Arrhenius certainly discusses it and if you want to go through the IPCC report it is covered in there. it's climate change 101. Anyway I asked if mans contribution to the total carbon dioxide levels are so small why did it wait till the the industrial revolution to increase from around 280ppm to beyond 400ppm? I know you say if I read through the right books I will get an idea but you have already read them so can you provide a quick explanation in layman terms why such a thing should happen now and not at any other time in the geological record that is not obviously ridiculous? Can we drop the pretense that the fact that water vapour affects climate is missed out by people that can be described as climatologists because they are stupid or that it's a secret, such a good secret its publicly available on Wikipedia. Svante Arrhenius certainly discusses it and if you want to go through the IPCC report it is covered in there. it's climate change 101. Can we drop the pretense that Svante Arhenius is science? His theory was falsified a long time ago, by the laws of thermodynamics. How about dropping the pretense that the IPCC is interested in anything but their own power? Or that you can actually measure a global temperature? Or that Wikipedia is any kind of source? Then we can discuss that no matter what Holy Gas you choose, you can't heat the warmer surface with it unless you resort to chemical or nuclear reactions. Except in your deluded mind, if someone takes your idiocy seriously that's when I loose respect for them. Despite my urge to answer your questions I have come to believe it would be a waste of time to try and keep discussing any climate change issue with you. I'm looking for people who firstly can discuss issues civilly and secondly not assume things and accept it as fact, which you have done with Prof. Carter's book and about myself. My perception is that you are far too biased in your beliefs to have an opinion worthy of consideration. Additionally your approach is antagonistic and I can do without that thank you. Nor do your posts stick to the point. You tend to fly about all over the place for example a graph of the CO2 emissions over Mauna Loa in Hawaii - which sits right on top of an active volcanic area anyway, wasn't in my mind in any way supportive of the discussion then taking place on the residence time of CO2 in the atmosphere. You refuse to believe - and react aggressively to any suggestion that man's contributions of CO2 to the atmosphere might be smaller than you apparently seem to think it is - at least that how it seems to me. I am therefore cutting you off as a likely and unreliable source of information which might convince me to alter my own current understanding of global warming being caused by mankind. You see I do actually believe mankind is culpable to some extent, just obviously not enough for you. Let me please offer this bit of life advice which you sorely seem to need on this issue and the way you seem to engage others - in life you will get back whatever you dish out to others. Lighten up. Be pleasant. And maybe someone will listen to you and you'll have less arguments. (1017) If you did not want questions asked why post here? All I did was point out some problems your assertions have and use common knowledge to make some criticism. I asked one simple question. I assume you can't answer my question. But we can pretend that water vapour in the atmosphere is neglected if you like and we can pretend that the graph I posted is not confirmed by other work, If telling you what really is happening in the real world hurts your feelings. If you did not want questions asked why post here? I post here looking for mature, considered answers from people who can respond without bias or juvenile emotion. I assume you can't answer my question. To seem to assume a lot of things, and all of them so far have been wrong. If telling you what really is happening in the real world hurts your feelings. Your perception of what is really happening in the world is obviously very different from mine. Life I said before I consider it a waste of time trying to reason with you because your own bias clouds your mind. Just go away unless you can discuss things on a more mature level. Actually, it did. You should really go look up the history of both theories. My bias that there must be a cause for carbon dioxide levels increasing? Its immature to point out that your ideas are at odds with basic physics and chemistry? You can choose not to respond but if you wish to peddle misinformation in order to advance an anti-environmentalist agenda for what ever reason you appear have the right to do that here on this forum. And I have the right to respond and to point out what you are doing.